The Economic and Social Commission for Asia and the Pacific (ESCAP) convened the third session of the Asia-Pacific Forum on Sustainable Development (APFSD 2016) on 3-5 April 2016, at the UN Conference Centre in Bangkok, Thailand. APFSD 2016 met on the theme “Regional priorities for the implementation of the 2030 Agenda for Sustainable Development in Asia and the Pacific.” The first regional forum on sustainable development to take place following the adoption of the 2030 Agenda in September 2015, it shaped the regional response to the 2030 Agenda. The Forum engaged member States, United Nations institutions and other institutions, major groups and other stakeholders on regional priorities for the implementation of the 2030 Agenda in Asia and the Pacific, reflecting ESCAP’s mandate for follow up and review. It also made recommendations on scientific and technological innovation for sustainable development and on making cities inclusive, safe, resilient and sustainable. As requested by the second session of the Forum, the third session discussed a regional road map for implementing the 2030 Agenda in Asia and the Pacific. The Forum also agreed on its form, function and modalities after 2016. The conclusions and recommendations of the Forum help to strengthen national governments implementation efforts and, pursuant to General Assembly resolution 69/290, and will also inform the global debate at the High-level Political Forum on Sustainable Development, which will be convened in New York during July 2016. 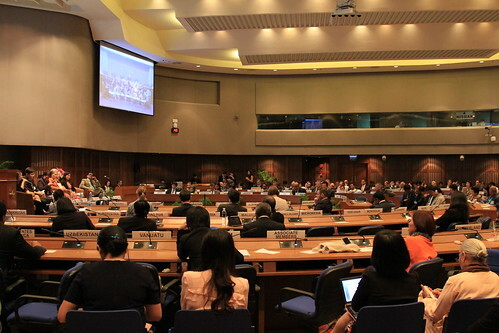 The Asia-Pacific Civil Society Forum on Sustainable Development was held from 31 March to 2 April 2015 in Bangkok as a preparatory event for the APFSD. Please visit the documents page for APFSD 2016 documents. How ready are we to build inclusive and engaging societies?